Last week I had the opportunity to meet Pak Suyanto living in Borongan Village, in the Polanharjo subdistrict of Klaten located in Central Java. Pak Suyanto is a biogas user with a great success story that all began from his decision to use biogas 10 months ago. When I first heard that we were visiting a user who runs his entire biogas reactor off quail dung alone I thought, how could he possibly collect enough dung to create enough biogas for his household? In fact, as I soon saw, it is possible as Pak Suyanto farms around 5,000 quails behind his house. Therefore, he is more than capable of collecting large amounts of dung every day to feed his biogas reactor. Pak Suyanto first became aware of biogas technology and its benefits through one of his friends, he then reached out to Biogas Rumah (BIRU) to meet with him and discuss the installation of a biogas reactor at his home. At the price of Rp.15.000.000, Pak Suyanto independently paid for the 12 m3 reactor without the help of government funding or a loan. Since January 2017, he now uses quail dung as the primary material for his biogas reactor, feeding it approximately 140 kgs of dung per day. This amount of quail dung has the ability to produce an incredible amount of high-pressure biogas daily and is used to power three gas stoves and one light for him and his family to use. Pak Suyanto said that since he has started using biogas he has stopped buying LPG gas to power his stove and says that the amount of gas created through biogas is more than enough for his household. 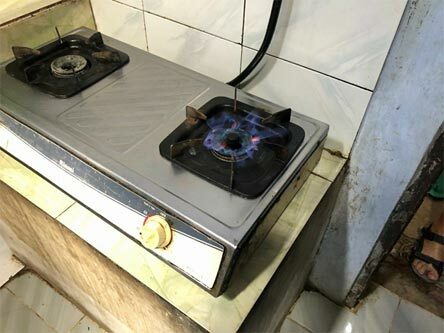 Although biogas itself does not generate cash income, it decreases user expenditures by reducing cooking fuel expenses. By using biogas as his main source of gas for cooking and lighting, Pak Suyanto saves the money that he would otherwise spend on LPG gas. As a quail farmer, this is Pak Suyanto’s main form of income and the ability to create free biogas is an additional benefit to his business. 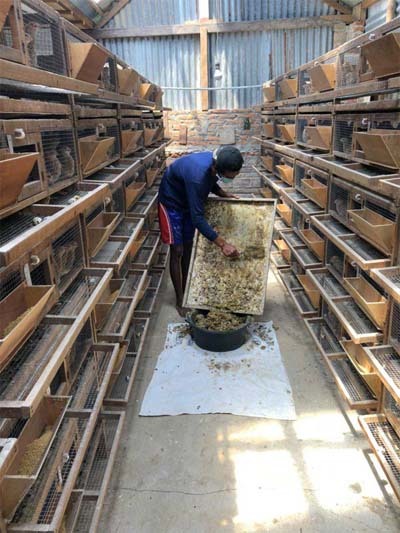 Pak Suyanto has a permanent contract in place with local distributor who sells his quail eggs by the kilo (approximately 83 eggs in one kilo) for Rp. 20.000 to supermarkets or other food markets. He also explained that each quail will lay at least one egg per day and are productive for approximately one and a half years. Once the quails stop producing eggs he has another agreement with the same distributor whom he sells his old quails to for meat at the price of Rp. 5.000 each. Taking these prices into consideration, Pak Suyanto’s estimated net profit obtained through the sale of quail eggs and meat alone is Rp. 1.250.000 per day. This figure explains how Pak Suyanto was able to pay for his biogas reactor without the help of a loan. As biogas plants use locally available raw materials that allow cheaper and reliable gas production, Pak Suyanto is now able to manage the waste created by the quails while providing his family with an essentially free source of energy. Additional to the financial savings and waste management benefits of using biogas, is the benefits that Pak Suyanto obtains through using the bio-slurry on his crops. Bio-slurry is an important byproduct of biogas production and is a great fertilizer due to its high nutrient content. It has the ability to improve soil fertility, soil structure and increase the yield of crops. Digested slurry, when used as a fertilizer, has been proven to have strong effects on plant tolerance to diseases and therefore can also be used as a non-chemical pesticide, as well as an effective organic fertilizer. Bio-slurry can be used in a liquid, composted, or dry form. Pak Suyanto uses the bio-slurry as a fertilizer for his rice field in liquid form by taking it directly from the slurry pit and applying it to his rice crops through an irrigation system that distributes the slurry throughout his rice field. 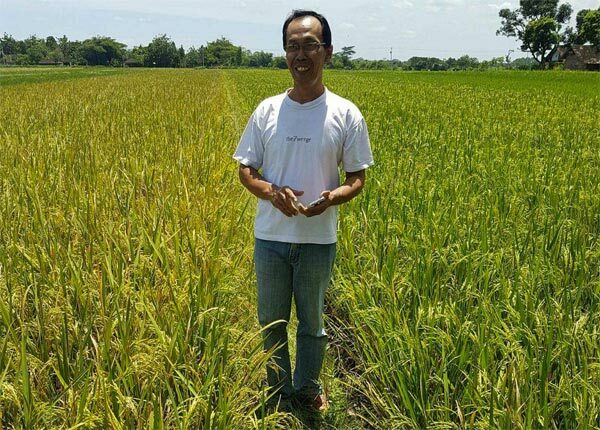 Since applying bio-slurry to his rice field, Pak Suyanto said that he has noticed an increase in quality and crop yield, as well as a faster turn over of rice as the bio-slurry has helped the growth of his rice crops. Pak Suyantosaid that since using bio-slurry, he can now grow and harvest the rice in his field 3 times per year. 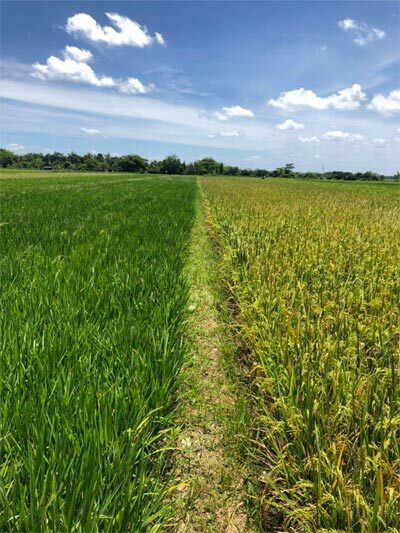 The photo above shows Pak Suyanto’s rice field on the left looking more impressive compared to his neighbor's fields that uses ordinary fertilizers and pesticides rather than bio-slurry.